Classic design and modern materials meet to create the world's best insulated, most weather resistant, and most comfortable dog houses. The core of our designs is a unique U.S.-made engineered wood product with a simulated rough-sawn cedar finish. Our engineered wood was designed for superior strength and structural integrity, as well as the highest possible level of moisture, rot, scratch, dent, and insect resistance. As a result, our dog houses resist warping, cracking and splitting better than any other wood dog house. The manufacturer of our engineered wood provides a 30-year warranty when it is used as an exterior siding in residential construction! Most of our competitors use plywood, pine, fir, other soft woods, or inferior grades of cedar. These woods lack the structural integrity of our engineered wood and are prone to cracking, curling, warping, moisture rot and other damage when subjected to rain and temperature extremes. Even western red cedar, commonly touted as the best wood for outdoor construction, falls significantly short of the performance characteristics of modern engineered wood. Many people and dogs also have an allergic reaction to the natural oils in cedar, which can result in skin itch and rashes. Chinese-made dog houses typically utilize low-quality Asian softwoods which do not hold up well in the North American climate. Given the recent scandals involving tainted food products and paint from China, significant concerns have also been raised regarding the safety of the finishes applied to many Chinese dog houses. Even worse, some of our competitors use plastics to build their houses. Plastic is a very poor choice for a dog house as it can emit volatile organic chemicals (VOCs) especially in hot climates, it lacks appropriate thermal insulation properties (too hot in summer, cold in winter), and it generally degrades and becomes brittle relatively quickly due to damage from UV light from the sun. Our engineered woods are also environmentally-friendly since they can be made with second-growth, smaller-diameter trees as well as material left over from the cutting of dimensional lumber, thereby utilizing material that would otherwise be wasted. Sadly, western red cedar is often cut from old-growth Pacific-coast rainforests. Our dog houses come completely pre-finished ready for assembly and use. Most of our competitor's dog houses require staining or the application of a water sealant to protect them from the elements. Even western red cedar dog houses require a water sealant to prevent them from weathering and turning grey, causing them to lose their attractive finish in as little as a year or two. This water sealant must be re-applied at least every few years. Our insulated houses utilize true foam insulation, the same type of insulation that is commonly used to insulate basements in homes. Our insulation is made in Canada and is CFC-free. Our insulation layer is thick, up to 1 1/2 inches. While our competition uses a variety of insulation materials, most use only 1/4 to 3/4 inches of insulation. Even when combined with a reflective layer, this thin insulation does not protect nearly as well as our thick insulation layer. Moreover, our thicker insulation provides better noise reduction so sounds will not disturb your pet. To protect our insulation layer, we use a 1/4" layer of furniture-grade mahogany. This material forms the liner inside our insulated dog houses. Our main competitor uses only a thin 1/8" liner. 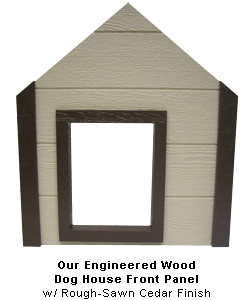 Our floors (base) and roof panels are framed with select-grade spruce lumber. A thick latex coating seals the entire base to protect it from moisture providing superior protection as compared to treated lumber. Raised nylon feet are provided to protect this coating and to ensure your dog house does not scratch the surface of your deck. They also provide air circulation under your house. If you have any questions about the materials used in our dog houses, please do not hesitate to contact us toll free at 1-877-374-2695.